Facing Cancer is a life-changing event, one that prompts soul-searching and reevaluation of all that one holds true. In the years following their own cancer treatments, authors Elena Dorfman and Heidi Schultz Adams were left wondering, What difference has cancer made in other people’s lives? What does it mean to survive a life-threatening illness?. 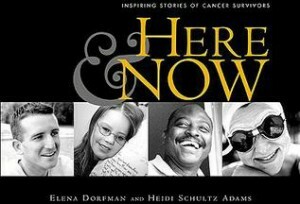 Here & Now offers 38 photographic portraits and personal stories from people of all ages and walks of life, who have confronted cancer at some point in their lives. Their stories explore the universal questions raised by a cancer diagnosis. It is their unique answers to those questions that have made each survivor who they are today. Elena Dorfman is a professional photographer and the author of The C-Word: Teenagers and Their Families Living with Cancer. A cancer survivor herself, Dorfman has lectured nationally on young adult and post-treatment issues. Heidi Schultz Adams is a writer, cancer survivor, and the founder of Planet Cancer, an organization that supports young adults with cancer.